The college, in partnership with LEAP Sports Scotland, is sponsoring the Team Kit which was launched at a special event held in the college’s City campus on Wednesday 27 June. "Sport is for everyone, and this will mark the first time many of the team have taken part in a sports tournament like this. It is a privilege for LEAP Sports to work with and support the team towards participation, inclusion and personal best - the three goals of the Gay Games. Partnerships such as this are so valuable and we are delighted to have the support of City of Glasgow College in making this initiative happen". The Gay Games have been running every four years since 1982. They bring together people from all walks of life, without discrimination, and are open to all, offering everyone the opportunity to participate in their own way. 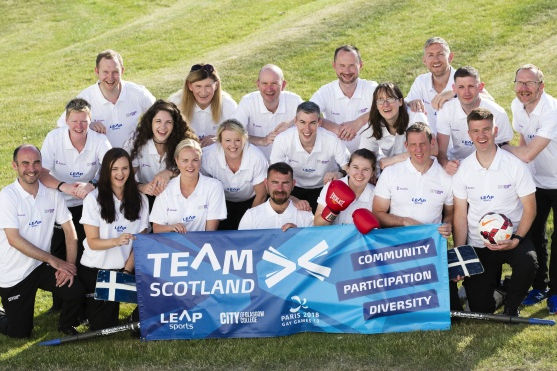 LEAP Sports are coordinating the team’s participation in the opening and closing ceremonies, pre-games briefings, official merchandise and a Team Scotland reception in Paris. Written on 28th June 2018.